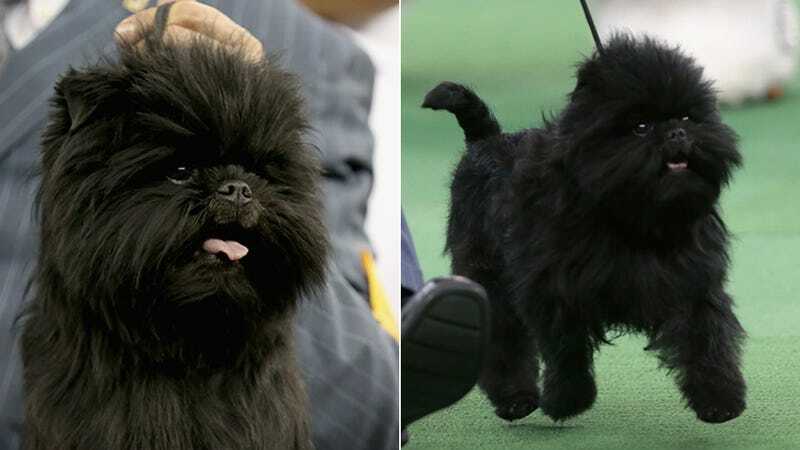 Last night, while the rest of you were tuning into the State of the Union address, Banana Joe, an affenpinscher, was winning Best in Show at the Westminster Kennel Club Dog Show. The six other finalists (read: losers) were a Portuguese water dog named Matisse, a bichon frisé named Honor, an American foxhound named Jewel, a German wirehaired pointer named Oakley, a smooth fox terrier named Adam and — as crowd favorite — an Old English sheepdog named Swagger (#YOLO). "This little fella seemed to want it a touch more. He's a fantastic affenpinscher, with a fantastic face, a great body. I've never had my hands on a better affenpinscher. Ever," said the Westminster judge, probably attempting to hide a semi. "He has the muscle tone of a big dog." Banana Joe played the win pretty cool. "I don't think he has anything to prove," his trainer told the New York Times. "I'm not bragging, this is just the way he is. The best thing is that I was in cue with him. This isn't a breed you train. He's like a human. You befriend him." And who couldn't use a friend named Banana Joe?